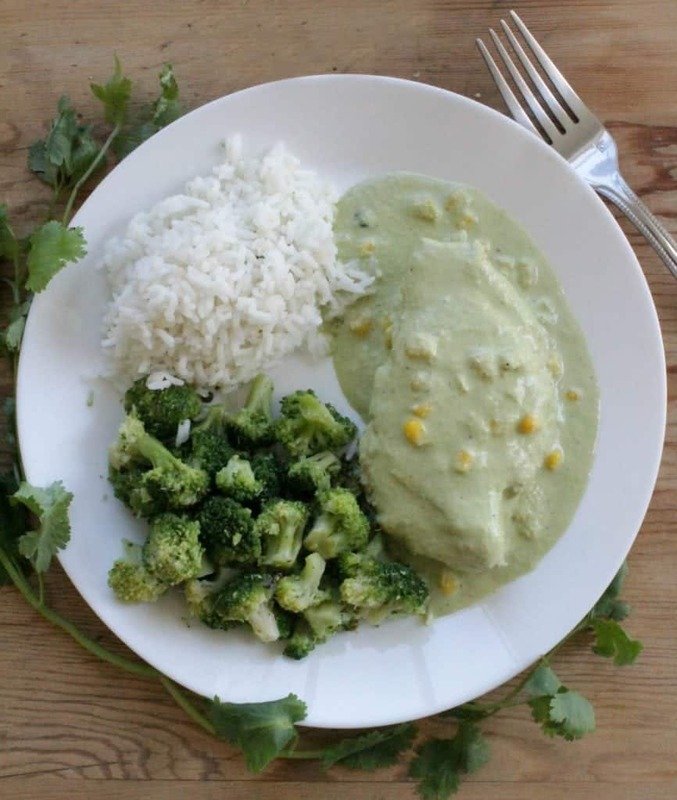 Chicken in Creamy Poblano Sauce (or Pollo en Crema de Chile Poblano) will make you want to lick your plate clean. Chicken in Creamy Poblano Sauce (or Pollo en Crema de Chile Poblano) starts with roasted poblano peppers. Some people call them pasilla. We have so many words to describe things in Spanish. Trust me, it can get confusing. Roast the peppers. Cover them in plastic to let them steam for 10 minutes. Remove the charred skin. Open them up, and remove the seeds and veins from the inside. From here, rough chop the poblano pepper and set aside. Watch the video above for help! You guys… Crema Mexicana is so good. It’s very versatile. You can use it in both sweet and savory dishes. I’m referring to the unsweetened kind here. Not the salted. There is a salted version which is also tasty. If you can’t find these at your local store, you can substitute with heavy whipping cream. Lastly, put everything in your handy dandy blender and let ‘er rip. 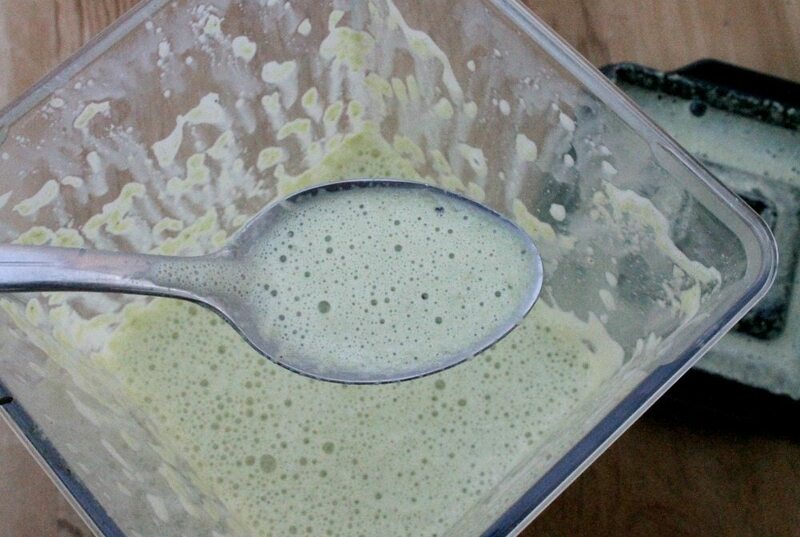 Blend until smooth and set this “awesome-sauce” aside. Salt and pepper the chicken. Cook the chicken. I used boneless chicken breasts, but feel free to use whatever cut of chicken you prefer. Once the chicken is fully cooked, add the poblano sauce and cook for a few more minutes. Don’t let this cook too long or it will curdle. Serve with white rice to soak up all the yummy sauce. I like to add a couple of kernels of corn. That combination is just DELICIOUS. 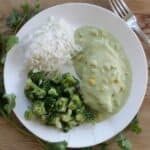 Chicken in Creamy Poblano Sauce (or Pollo en Crema de Chile Poblano), is a classic Mexican dish that is so good, it’s hard not to love. Hope you enjoy! Cook until no longer pink in the middle, and the juices run clear. About 4-5 minutes on each side. Note: Don’t clean the pan yet. You’ll need it again. Meanwhile, roast the chile poblanos. Remove the skin, devein, and take out the seeds from inside. Cut and dice the chile poblano and add to the blender. Add the evaporated milk, the onion, garlic clove to the blender. In the same skillet you cooked the chicken, melt the butter. Add the poblano sauce and chicken bouillon. Right before serving, add the Mexican crema and the corn kernels. Cook for 1 minute or until the corn kernels have been cooked. Immediately remove from heat and serve with white rice. I am never without salsa either…everyone in my family loves it and it’s a healthy snack choice. I love the sound of this poblano sauce. This meal would be a hit in my household! I’m a sauce girl too . The sauce make the meal! 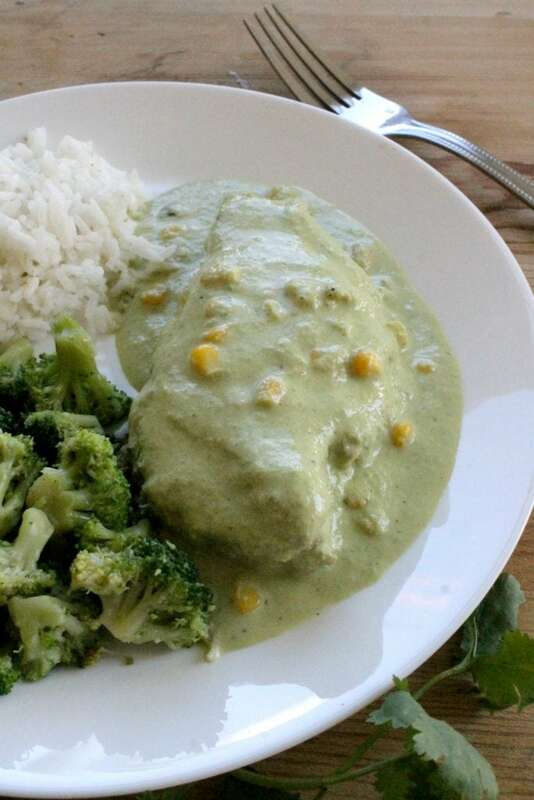 This creamy poblano sauce sounds divine. I bet it would be great over roasted vegetables too. Yes. That’s why I always serve this dish with veggies and rice on the side. YUM! I have never cooked a poblano pepper before. You make it look so easy and tasty too. They’re not hard to make at all. Hope you give it a try. oh yay! This sauce looks amazing. 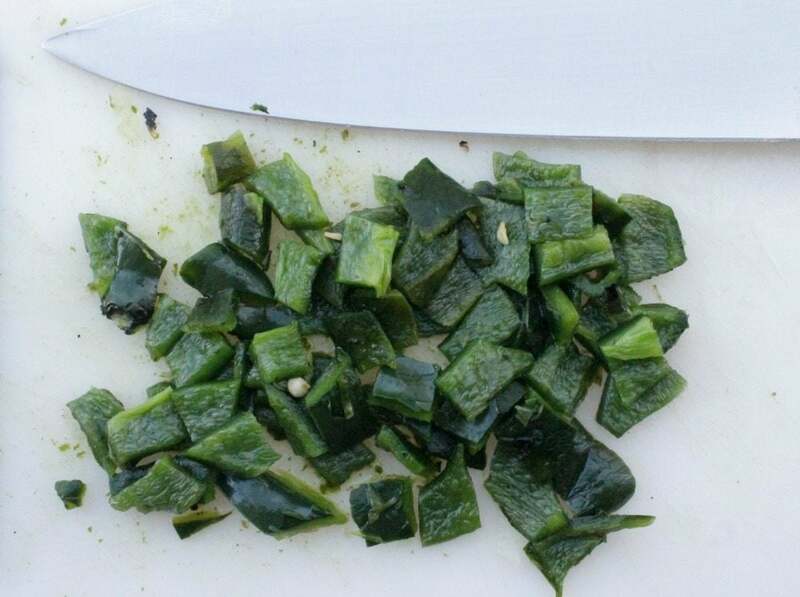 Poblano peppers totally intimidate me – thanks for the tutorial. Tried to make this, but mine I feel mine was more on the chunky side and not smooth. How much milk did you use. Your ingredients list only states a can of evaporated milk, but doesn’t say what size. What size do you use? I want to give this another try as it does look very good. I’ve done a green sauce with my enchiladas but never used it with chicken. Made this last night and it was delicious…. I did change it a bit by caramelizing the onions first, extra garlic (I’m a garlic super fan! ), didn’t have any evaporated milk so I did a whole milk/half and half mixture. It was amazing!! !